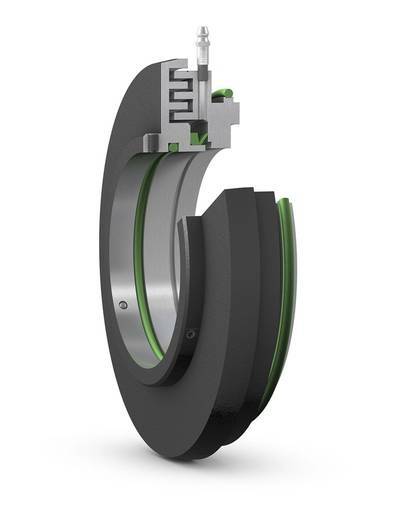 A new SKF Taconite Seal for bearings in split block housings protects against contaminated or wet operating conditions. According to the manufacturer, benefits of this multi-stage labyrinth cartridge seal include exclusion of contaminants, improved prevention of water ingress (even during high-pressure washing), maximized bearing and seal service life, reduced grease consumption, reduced environmental impact and optimized machine performance and uptime. The seal provides an especially practical barrier solution for demanding applications such as conveyor pulleys, hoists and winches, pulverizers, fans and similar equipment in the mining, cement, pulp and paper, steel and marine industries, among others. The SKF Taconite seal (machined cast iron or steel) consists of two rings (one stationary and one rotating), which form a narrow labyrinth between them. The rotating labyrinth ring carries an internal, low-friction V-ring seal that seals against the stationary labyrinth ring, blocks contaminants from entering the bearing housing, and contributes to effective purging of grease. The rotating labyrinth ring, facing the bearing housing, serves to deflect and fling away water.